Xiaomi Redmi Note 6 Likely to Debut on November 6 in China - Playfuldroid! 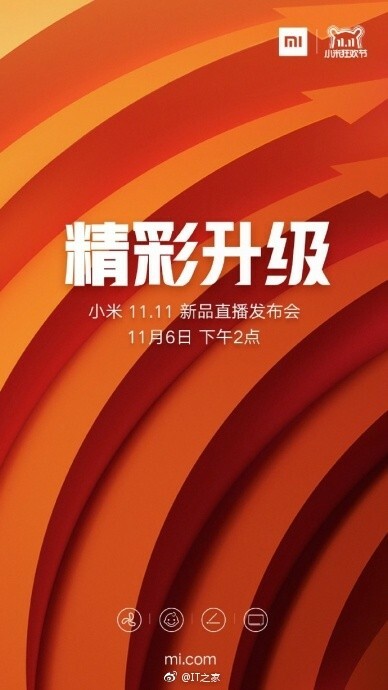 The Xiaomi Mall Weibo account has confirmed that the company will be announcing a new product on Nov. 6. The the launch poster only confirms the date and timing of the new product launch and it does not include the name of the device that will be announced next week. Rumors are rife that the Chinese manufacturer will be launching the Redmi Note 6 smartphone on the said date. Xiaomi Redmi Note 6 Pro was made official discreetly in Thailand at the end of September. However, it is yet to launch in China. Now that Xiaomi has announced the Mi MIX 3 flagship phone in the home market, it could be gearing up to debut the Redmi Note 6. The tagline mentioned on the launch poster says that it is the device arriving is an excellent upgrade. Probably, it could be hinting the Redmi Note 6 is a worth upgrade for the Redmi Note 5 that was made official in China in March. 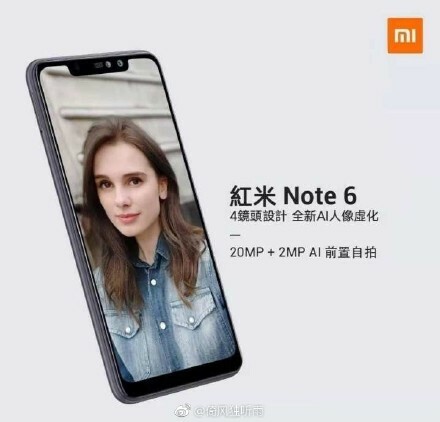 A leaked promotional image of the Redmi Note 6 that has been spotted on Weibo reveals that it has four cameras and carries AI portrait mode. The Redmi Note 6 is equipped LCD screen of 6.26 inches with 19.5:9 aspect ratio. It is the first Redmi phone to feature four cameras. The 20-megapixel + 2-megapixel dual selfie snapper is present inside the notch of the phone. The 12-megapixel + 5-megapixel vertical dual camera setup resides on the backside of the phone. The Snapdragon 636 chipset powers the phone. It comes with up to 6 GB of RAM and an up to 64 GB of inbuilt storage. In Thailand, it was made available in colors like Black, Blue, Red and Rose Gold.